Prepare 8 x 4 loaf pan by lining with aluminum foil and spraying foil with nonstick cooking spray. In small saucepan over medium-high heat, melt butter. Add brown sugar, corn syrup, and salt, and stir until brown sugar dissolves. Once brown sugar melts, start timer and cook candy for exactly 6 minutes, stirring constantly with wooden spoon. If you use a candy thermometer, stir and boil toffee until it reaches 290 degrees. After six minutes, take toffee (buttercrunch) pan off heat and stir in 1/2 cup chopped toasted almonds. Scrape toffee into prepared loaf pan—it should be in a layer about 1/2-inch thick. Let toffee set for about 3 minutes, then use pizza cutter or paring knife to cut toffee into thin bars about 1/2-inch by 2 -1/2 inches. They will look small, but once they're dipped in chocolate and rolled in nuts, they'll be bigger. After another 2 minutes, go over your cuts again as toffee continues to harden. As you wait for toffee to set, chop remaining 1 cup of toasted almonds very finely, or put them in food processor and pulse for several seconds until they are in very small pieces. Pour finely chopped almonds into shallow bowl. Once toffee is completely cool and set, break into pieces along lines you made, and trim off any jagged edges with knife. Melt chocolate. Dip each piece of Almond Buttercrunch in melted chocolate, then place in bowl of nuts. Roll it around until coated with nuts on all sides, then take it out of nuts with fork and place on baking sheet. Repeat until all toffee pieces are coated with chocolate and nuts. 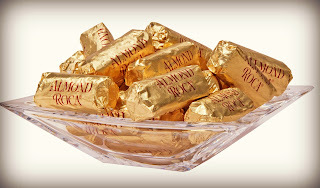 Optional: To make it 'really' look like Almond Roca, wrap individual pieces in gold foil. Refrigerate tray to set chocolate (about 10 minutes). Store in airtight container in refrigerator for up to two weeks. Wow. That's all there is to it?